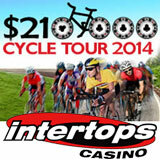 Take a cross country bike tour with Intertops Casino this summer and collect your share of the $30,000 in casino bonuses they're giving away every week until September 1. Pedal your way to the top of the $210,000 Cycle Tour Scoreboard and you can win prizes up to $500 each week and at the end of the race you could be one of two players that will each win a $1000 cash prize in the Bike Bonanza draw. You'll find hundreds of real-money online casino games at Intertops including Blackjack, Roulette and some of the world’s most popular online slots -- some with million dollar jackpots like Aztec’s Millions. You'll automatically earn points just by playing and bee ranked on the Cycle Tour Scoreboard.